The Chloride content is an important factor which influences the durability of concrete structures. The standard methods are mostly intricate, time consuming and require a chemical laboratory. This article describes the application of a spectroscopic method, the laser-induced breakdown spectroscopy (LIBS), for the determination of Chloride contents in concrete and mortar specimens. LIBS can be used on-site, needs no sample preparation and is able to investigate rapidly a large number of different measuring points. The LIBS set-up and the experimental conditions to detect Chlorides are reported. Calibration curves are presented and the limit of detection (LOD) is determined. Results measured on different concrete cores are presented and compared with the results of standard chemical methods. To evaluate the durability of reinforced concrete structures the measurement of the Chloride content is necessary. The standard chemical method for the determination of the Chloride content includes the taking of cores, the splitting of the core to obtain information about the depth profile of the Chloride ingress (depth resolution 1-2 cm), grinding, solution of the material in nitric acid and electrochemical determination of the Chloride ions in solution. This procedure is time consuming and requires a chemical laboratory [Ref 1, Ref 2]. Hence there is a need for a fast method, which can be used on-site and is able to investigate a wide range of different measuring points. We suggest the laser-induced breakdown spectroscopy (LIBS) as a new tool for the measurement of the chloride content in building materials. LIBS is a rapidly developing technique which allows the quantitative measurement of almost all elements on the surface of solids or liquids and in gases. A short laser pulse evaporates a small amount of material (typical some micrograms) creating a plasma plume. The plasma radiation is used to investigate the chemical composition using spectroscopic techniques. Applications for different fields from medicine to industrial quality control, sorting of waste or space exploration are established [Ref 3 - Ref 6]. Applications in civil engineering are the investigation of the elemental composition of cement or concrete specimens, the quantitative measurement of trace elements, the detection of hydrophobic layers and the measurement of the salt content [Ref 7, Ref 8]. The LIBS equipment used for civil engineering applications is in principle portable and could be used on-site. Measurements can be performed directly on the sample surface and the results are available on-line. An example for a possible application is the quality assurance in the field of concrete repair to ensure that chloride contaminated concrete has been removed completely. Large areas as bridge surfaces could be tested and further removal could be immediately instructed if necessary. 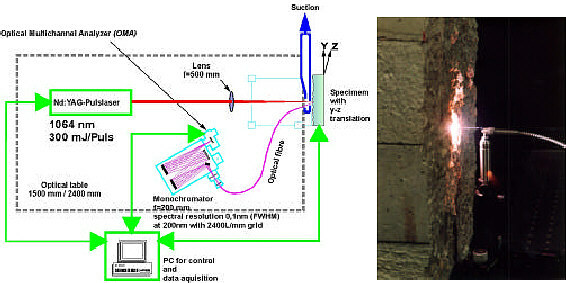 Fig 1: On the left side the schematic experimental setup is shown. On the right side a photograph shows the plasma on the surface of a building material. For applications in civil engineering either the surface can be scanned, or depth profiles are available from cores. We present LIBS results measured on concrete cores from different sites in comparison with the results of standard chemical methods. The optimum set-up and the experimental conditions for Chloride detection, calibration curves and results measured on cores, grinded and pressed material are presented. The LIBS results are compared with results of standard chemical methods. The limit of detection (LOD) is estimated. The experimental set-up is shown in figure 1. The radiation of a pulsed Nd-YAG Laser (pulse duration 10 ns, maximal energy 300 mJ/pulse, repetition frequency 20 Hz) is focussed on the surface of the sample to generate a plasma (figure 1 right). The fluorescence radiation of the plasma is guided through an optical fibre to the detection unit. In front of the optical fiber we installed a spectral filter (transmits light > 550 nm) to avoid interference with higher spectral orders. The wavelength range is adjusted by a monochromator with 1200 L/mm grating. For the Chloride detection we use an OMA 4 detector (EG&G, CCD-Array 1024 * 256 Pixel, 18 bit intensity resolution, detector temperature -20°C). The detector is a non intensified system with a comparative high quantum-efficiency in the NIR. Due to the absence of an intensifier time-resolved measurements are not possible. Only a mechanical shutter with a time constant of 15 ms is available. Typical exposure times used are in the range from 300 ms to 1720 ms.
Much work has been done to find and identify a suitable Chlorine spectral line for chloride detection in building materials. Due to the multiplicity of the - partially overlapping - spectral lines of the elements, which are naturally part of building materials, one has to find a spectral window in which a Chlorine spectral line occurs with sufficient intensity. Mainly Calcium as a main component of the material has strong spectral lines spread all over the visible and NIR region. The Chlorine spectral line at 837.6 nm has been reported to be good detectable and quite strong in gases and solid organic compounds [Ref 9, Ref 10]. This spectral line could be detected easily in measurements on PVC samples in our laboratory with the described set-up. For measurements of Chloride content a wavelength range has to be chosen so that on the one hand the Chlorine spectral line can be detected well resolved and on the other hand spectral lines from at least one main element component are included. This is necessary for internal calibration. A typical spectrum measured in the selected wavelength range is shown in figure 2 and runs from 811 nm to 869 nm. Table 1: Assignment of spectral lines to elements. Fig 2: Measurement on building material. Identification of the spectral lines, which occur in the wavelength range under investigation. Although the Chlorine spectral line is weak compared to the other spectral lines, mainly Calcium, it is the only suitable spectral feature for Chloride detection in building materials. To improve the sensitivity for the Chloride detection [Ref 11] the set-up was enhanced with a possibility to flush the area between optical fiber (edge filter) and sample with Helium [Ref 10]. This flushing volume is not closed, because the Helium gas flow also acts as carrier for the evaporated building material. In figure 3 a comparison between measurements with and without Helium is made. Due to the displacement of air by Helium no spectral features of gaseous Nitrogen or Oxygen occur. The Nitrogen lines disappear and also the sensitivity for the Chlorine spectral line is increased clearly. Fig 3: Comparison between measurements on cement mortar samples accomplished under Helium atmosphere and air. Mainly the spectral lines due to Nitrogen are suppressed under Helium atmosphere. The Sodium spectral lines are well resolved and the sensitivity for the Chlorine spectral feature is clearly enhanced. The initial calibration was performed on six cement mortar samples with well defined Sodium-Chloride additions (see table 2). The graduation in a wide concentration range was chosen so that the chloride detection was guaranteed. The samples were measured with the described LIBS set-up under Helium atmosphere. In Figure 4, left the measured Chlorine peaks in comparison of the Chloride content in the specimens are shown. A value for the Chloride content can be found by fitting the spectral lines with a gaussian profile. To take variations in the radiation intensity due to material properties or fluctuations in the laser energy into account a normalization is necessary. A common method is the calculation of line ratios. In this case the integral calculated for the Chlorine line was divided by the integral calculated for the Carbon line (l = 833.5 nm). The carbon content in the mortar samples was assumed to be constant. Table 2: Chloride content of cement mortar samples produced for calibration purposes. The resulting calibration curve in figure 4, right, shows a linear relation between Chloride content in the specimens and LIBS results. Fig 4: Left: Cl spectral line at 837,6 nm for cement mortar samples with varying Cl content. Right: Correlation between Chloride content of the cement mortar samples and normalized integral of Cl spectral line is plotted. 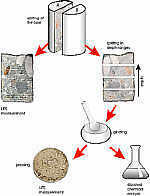 Fig 5: Sample preparation and measurement program. On split core half A the tracks caused by LIBS measurements are visible. Two concrete cores (NL6, diameter 35 mm and NL7, diameter 55 mm) were investigated in a way illustrated in figure 5. First the core was split in two parts. The surface from one half (named A) was used for LIBS measurements. We accomplished line scans with a resolution of about one millimetre. That means that for a line scan with a total length of 28 mm we obtain 30 single spectra. The interval between two lines is 2 mm. The exposure time of the detector was 860 ms for all measurements. The other half (B) was split in different depth ranges. The core with 35 mm diameter was divided in two parts with depth ranges from 0 mm to 20 mm and 20 mm to 40 mm, the core with 55 mm diameter was divided in four parts with 10 mm depth resolution each. These parts were grinded and then used for standard chemical analysis and for LIBS measurements on pressings made form the grinded material. For the LIBS measurements on the concrete cores the amount of cement and aggregate vaporized for a single measurement is varying. Caused by the size distribution of the aggregates which ranges from some centimetres to smaller than a millimetre. Figure 6 compares the results measured under Helium atmosphere on an aggregate and a point where mainly cement was vaporized. The spectrum of aggregate shows only Oxygen spectral lines from SiO2. Silicon has no lines in the chosen spectral region. The measurement on cement shows strong partially overloaded Calcium spectral lines. Also a Chlorine spectral line appears. Fig 6: Comparison of two measurements under Helium atmosphere on core NL6. The blue spectrum is measured on a position with a high cement content. The black spectrum is measured on an aggregate. Only Oxygen spectral lines from SiO2 are visible. Inlay: closer look to the Chlorine spectral line at 837.594 nm. For the measurements on the concrete cores the ratio of the intensity of the Calcium spectral line at 849.9 nm and the Oxygen spectral line at 844.6 nm can be employed as a measure for the ratio cement to aggregate. Values for this ratio vary between 0 and 1.5 for the measurements. For values higher than 0.5 we assigned the spectrum to result from cement and the Chlorine peak was evaluated. 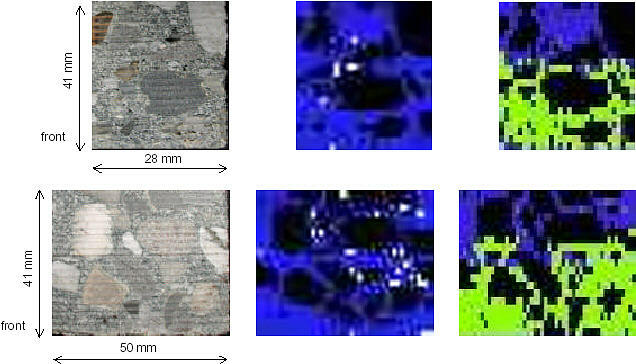 Figure 7 (left column) shows photographs of the split concrete cores with visible tracks of LIBS measurements. The middle column shows the spatially resolved colour coded ratio of the intensities of the Oxygen and Calcium spectral lines. Black colour is used for ratios lower or equal 0.5, which were assigned to aggregates. Values higher than 0.5 are assigned to cement (blue or white colour) and a further analysis of the Chlorine peak is done. Figure 7 (right column) indicates by white or light grey colours were cement was assigned and a evaluation of the chlorine peak was possible. It can be seen that this is possible for depths up to 25 mm (see figure 10). Fig 7: Upper row: NL6, lower row: NL7. Left: Photograph of the split core, half A. Middle: Spatially resolved, colour coded ratio of the Calcium spectral line at 849.9 nm to the Oxygen spectral line at 844.6 nm. Black represents aggregate, blue or white colour represents cement. Right: Spatially resolved, colour coded Chloride distribution. Green colour represents points where a Chlorine spectral lines was evaluated. For a depth of more than approximately 25 mm no Chlorine spectral line could be evaluated. This way of interpretation means that we determine Chloride contents related to the cement matrix, but with the ratio between Calcium and Oxygen we can determine the percentage of cement per line scan (or depth interval) and use this information as weighting factor for the calculation of Chloride contents related to concrete. In figure 8 a comparison between results from standard chemical analysis (grey bars) and results from LIBS measurements on the cores are shown. The LIBS results are calculated by the mean of all evaluable normalized Chlorine peak integrals in the appropriate depth interval. Normalisation was done by the baseline value at the peak position. A good agreement between the results is visible. Fig 8: Comparison between results from standard chemical analysis and results from LIBS measurements on the cores. The Chlorine peak integral was normalized by the baseline. Additional the LIBS measurements were weighted by the percentage of cement, to relate them to concrete. To determine a detailed depth profile we averaged the cement spectra of each line scan and processed the data as described above. The integral of the Chlorine spectral line was determined by a gaussian fit and normalised by the baseline value at the peak position. The resulting depth profiles of the Chloride content with a resolution of 2 mm are shown in figure 9. Values equal zero means that no Chlorine peak was evaluated. The front value was measured on the surface of the core after one line scan for cleaning. Fig 9: Depth profiles of Chloride ingress, measured on cores NL6 and NL7. 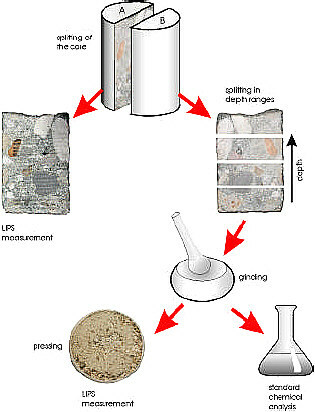 Figure 10 shows a comparison of the results measured on the cement mortar specimens (see table 2), the LIBS measurements on pressings made from grinded material of the concrete cores and LIBS results measured on the concrete cores. The values are plotted in relation to the Chloride content in the essential concentration range. The results are in good agreement, although the compositions of the matrices are different. A linear calibration function is determined. Fig 10: Comparison between results from cement mortar samples with results from NL7 and NL6. The Chlorine peak integral was normalized by the baseline. A Chloride content of 0,2 wt% is definitely detectable, but below 0.05 wt% it is not. So the LOD achieved with the actual LIBS set-up is between 0.05 wt% and 0.2 wt%. The set-up and the experimental conditions for Chloride detection in building materials are presented. A calibration curve from LIBS-measurements on cement mortar samples is obtained. A Chloride content in concrete cores can be measured with a detection limit of at least 0.2 wt%. Depth profiles with a resolution of 2 mm, a resolution which is not available by standard methods, are presented. A comparison of LIBS measurements and standard chemical analysis shows good agreement. Additionally a criterion to measure the percentage of cement was defined. This was used to create spatial resolved pictures of the cement and aggregate distribution, which agree well with reality. In the same way the traceability of Chloride was visualized. In principle it is possible to visualize the colour coded Chloride content in the same manner. It was shown, that the LIBS measurements are a suitable tool for the determination of Chloride contents in concrete. Compared with standard chemical methods LIBS can provide more information - a better depth and spatial resolution - and can be used on site. For future work it is necessary to adapt and optimise the method for on site use and to generate a calibration database to account for the variability of building materials. For an improved calibration it is necessary to produce reference samples and to collect more data. An improvement of the LOD can be reached by optimisation of the experimental set- up, e.g. with a dual pulse plasma generation, application of laser induced fluorescence or use of gateable detectors. The Authors gratefully acknowledge the support of Mr. J. Gulikers who provides concrete cores from a marine environment and wishes to thank Mrs. C. Hagemeister for performing standard chemical measurements on the cores.